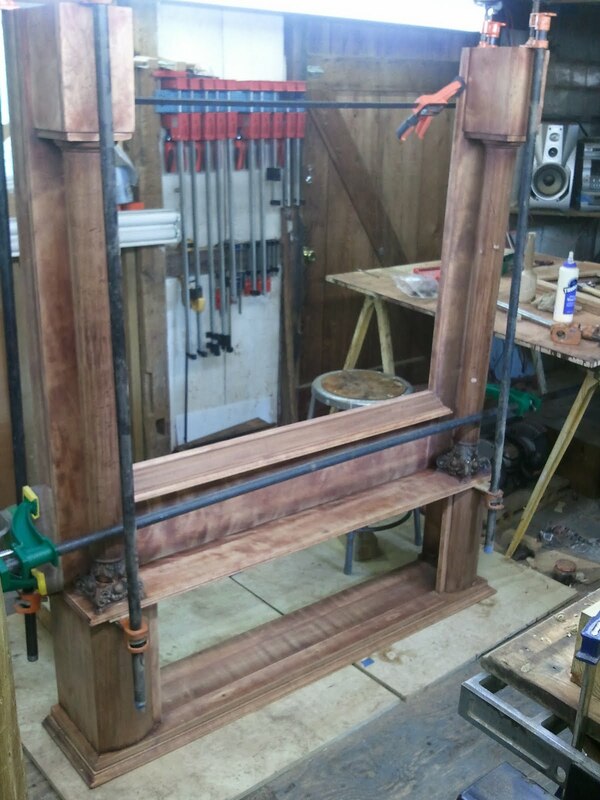 One of the pieces I have been working on recently is a late Victorian Mahogany and Birch mantel made around 1898. The mantel is somewhat typical of the era and has an overmantel storage area for books or plates. The doors for the overmantel have factory made stained glass panels that I think are original to the piece. The interior of the overmantel has plate grooves in the bottom, indicating that the piece was made with the option for clear glass in mind as well as the stained glass. What is most likely is that the mantel was ordered out of a catalog and the buyer was able to choose the glass that they wanted. When the mantel was removed and brought into the shop, I discovered that there was a date and signature on the back of the mantel. The inscription reads like this, "1898 F.W. 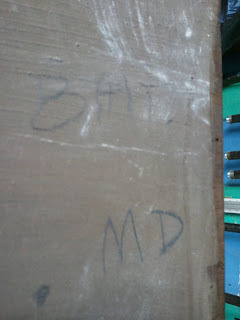 Balt. MD. "Written in Pencil. This could mean several things. It could mean that this mantel was made in 1898 by "F.W". in Baltimore, MD. 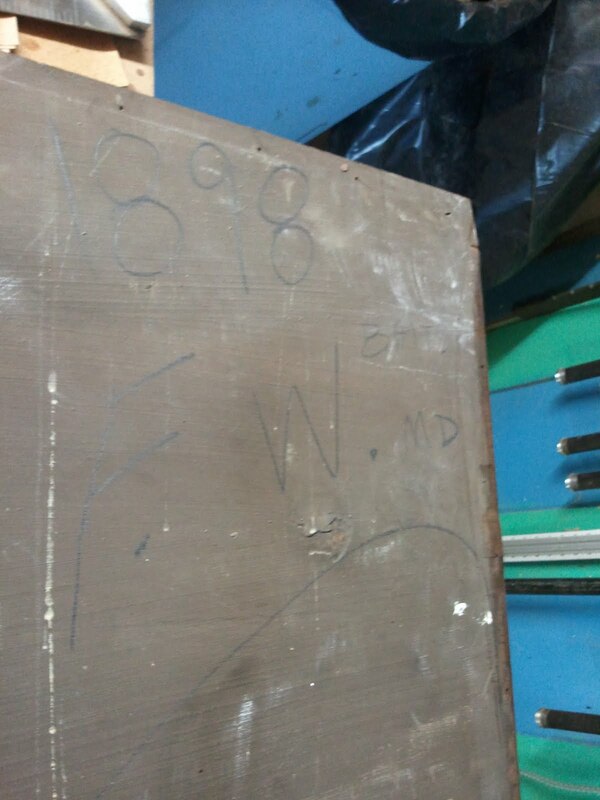 This could also be an inspection mark as it passed through Baltimore to it's final destination.Who "F.W." is remains a mystery. There was also a small label that had been painted over on the back of the mantel. 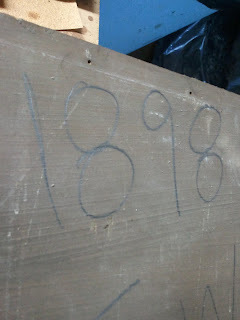 I was able to carefully scrape off the paint to reveal that the label was a stock label for the worker or inspector to write down the mill number, mantel type, manufacturer, and wood. Under the "made by" heading there is the faint remnant of a signature, but it is illegible. Most likely this is in reference to the person who assembled the mantel and not the company that produced it. So in the end, no manufacturer, but I was able to find an approximate date for the mantel's manufacture. The mantle was in pretty good shape over all, but the finish had cracked with age and cleaning. 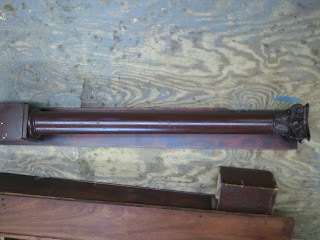 In addition, some areas, particularly the columns, had been touched up with paint of a mahogany color. Luckily, the use of paint was not to cover up some significant veneer loss, but looks most likely to be a cheap form of "Touch-Up". When the mantel was removed from the wall the 110 year old glue gave out at the joints, so it pretty much fell apart on site. Below is a photo of the mantel when it came into my shop. This next photo shows one of the columns that was painted. The following three photos are of the signature on the back of the mantel. 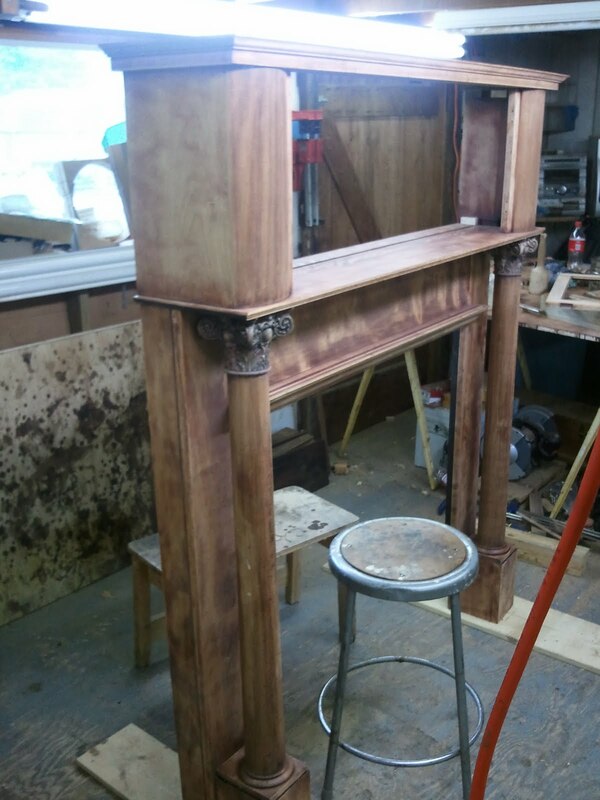 This next photo shows the overmantel being glued up. It was missing some glue blocks and had loosened up significantly. 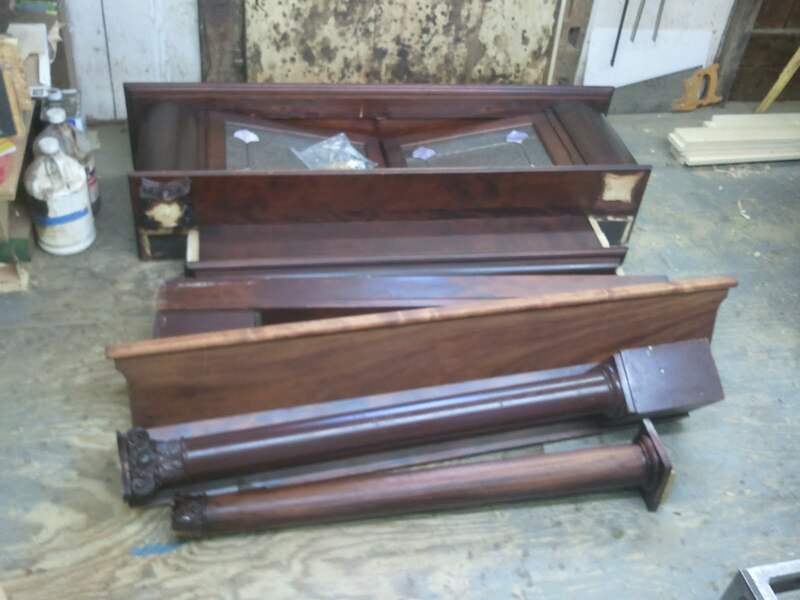 To assemble the mantel, the entire piece was flipped upside down. 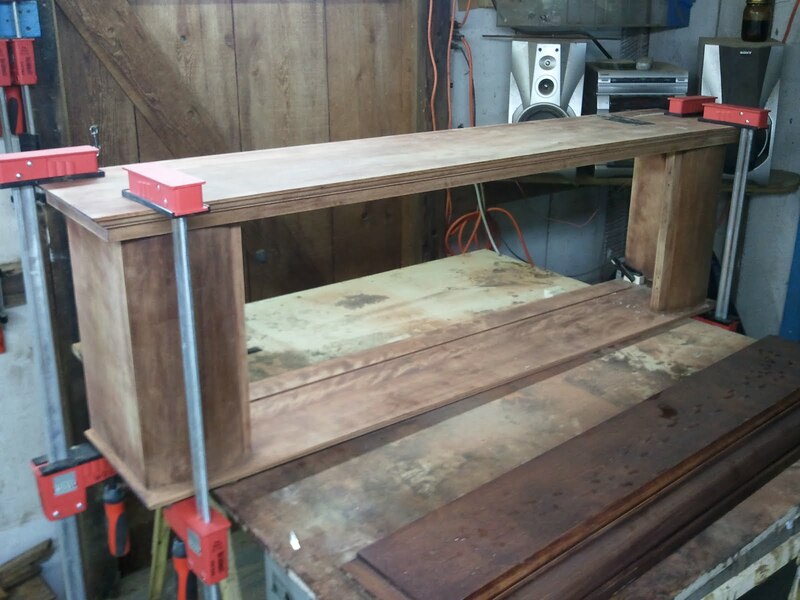 Certain parts of the mantel were screwed together and others glued. here is a photo of the mantel being glued up followed by the mantel flipped right side up. 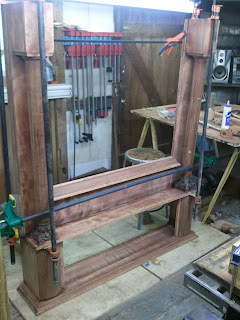 Supports were attached to the bottom to keep the mantel from falling over in the shop. The capitals of the columns were made from a resin that was poured into a mold and cast. Each capital was comprised of four sections that were glued to the column. there were several pieces missing from each capital, which I replaced and carved to match. 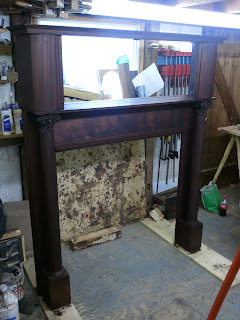 After all of the repairs were made and the mantel was sanded, the entire mantel was stained to the original color. The next photo shows the stained column. The next post will show some of the finishing of the mantel and photos of the mantel completed.